This blog is often a place of lament and, dare I admit it, whining about the lack of global action on the climate crisis. Today's post is going to be more positive -- and practical. Yesterday I attended a workshop on solar power and solar technologies that was put on by Heartwood Folk School here in my community (disclosure: I am on their board of directors). Despite a time conflict with the all-candidates meeting for our local elections, dozens of people turned up. We heard about solar thermal energy for hot water systems. We heard about solar photovoltaic for electricity. (As someone who lives in the shade -- my hubby is sun sensitive -- I've never considered these to be viable for my house.) Next we heard about heat pumps (that technology sure has improved over the years). And then we heard from a friend of ours, Ian Gartshore of Shore Energy Solutions, who is a dealer/installer for the SunPump™. Suddenly the workshop went from "interesting and informative" to "Oh my gosh, that's a possibility for my roof!" 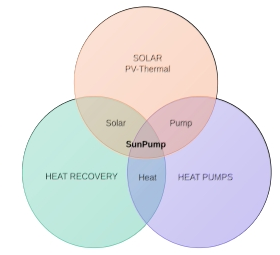 Imagine one hybrid system that is solar thermal (hot water), solar photovoltaic or PV (though I might skip that component due to our shade), and heat pump for home heating. The SunPump™ works in the cold, in the rain and in the dark as well as in the sun. That's because the roof panels are filled with refrigerant (not water or glycol) that transfers the heat even if it's -25ºC (-13ºF) outside. The system is about 50% more efficient that a regular heat pump. Plus it turns out the system costs less than installing these technologies separately -- BONUS! I'll admit that I'm electrically illiterate (did I ever tell you that I was hit by lightning as a child -- maybe explains a few things about me! -- and I've been afraid of electricity ever since), so I'm going to have to count on Shore Energy Solutions to walk me through the process of getting the most bang for my buck. But it sounds like this system will provide a much more comfortable home while also heating our water -- allowing me to join the Solar Age even while living amongst the trees. Never have I been so excited about what's happening on my roof.